Like its predecessors, Just Cause 4 is an open world action-adventure game full of secrets, achievements, and unlockables. If you're playing on Steam, you can take advantage of Just Cause 4 trainers to get infinite health, money, and ammo. The following Just Cause 4 cheats apply to the Xbox One, PS4, and PC versions unless otherwise noted. To unlock fast travel, first complete the Wanay Extraction mission, then go to the Wachikuni region and complete the Illapa Project mission. You can get more reserves on your side by liberating more enemy regions, but you will also automatically gain two squad reserves each time you increase your Chaos Level. Get a vehicle equipped with heavy artillery, go to any Black Hand base and take out all the red structures you see. With the Spectre Attack Heli assault chopper, you can quickly fill your chaos bar from the air without taking a hit. In the Vaivenes region, located in the southwest corner of the map, you'll find the Cow Gun sitting on the porch of a farm house. Getting shot with the Cow Gun turns anyone (including Rico) into a cow. Atop a white rock on the mountain's edge in the northwest corner of Picos Helados, you can find a black cauldron containing a pickax. Step inside the black cauldron to play a mini-game based on the popular indie title Getting Over It With Bennet Foddy. Visit the small city just west of Paso Ventoso. On the west side, there is a building under construction. Find your way inside and enjoy a tribute to the 1985 hit music video by A-HA. Crash into another airplane while flying. Use the air lifter for 15 minutes (boost and retract cannot be active). His Name is Luis Assist Sargento in stopping an invasion. A Whole Army of Chaos Obtain Army of Chaos Level 14. Assist Sargento in an ambush, then meet Javi Huerta and Garland King. Remove rigged vehicles from every harbor. Bring It Down! Complete Operation Thunderbarge. Chaos Milestone Fill your Chaos bar. Classic Hits Use retract for 15 minutes (booster and air lifter cannot be active). Cow-Moo-Flage Turn 10 Black Hand enemies into cows in a row. Don't Choke on My Smoke Beat another player's score while tracking a feat manually. I Feel the Need Film each speed stunt. Unlock all grappling hook mods. Get on the leader board for all feats. Discover the Lost Tomb of Otorongo. Assist Garland King with completing her picture. Use the booster for 15 minutes (air lifter and retract cannot be active). Destroy any vehicle with ricochet fire using the PBX Auto-Slug 4. Discover half of all locations. Obtain all blueprints for small arms and heavy weapons. What if I Dive Down? Complete Operation Windwalker. Stand atop the highest mountain peak in the Qacha region (cannot be visited until you finish the main story). Rico Was Here Earn all other achievements. Unlockables are items that can be unlocked once you meet specific requirements. 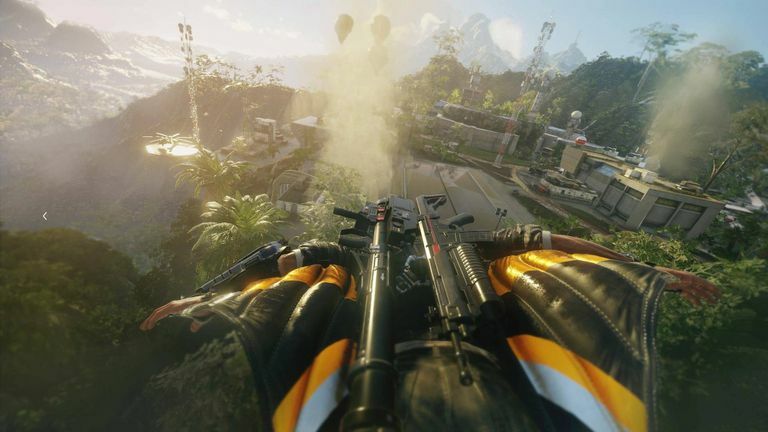 In Just Cause 4, the unlockables are vehicles and weapons. Vehicles require you to reach certain achievements before they are unlocked. Here are the requirements that need to be met to unlock each time of vehicle. Complete the Explanada car stunt. 83 Hatchback Car Complete the El Abismo stunt. Complete the Hermosa car stunt. Complete the Tributario Wanay speed stunt. Complete the Encrucijada car stunt. Complete the Joya Del Sol speed stunt. Complete the Nueva Voz Centro car stunt. Complete the Aburrida speed stunt. Complete the Casas Soleadas car stunt. Complete the Quya car stunt. Complete the El Lucero stunt. Complete the Boca Vieja car stunt. Complete the Punto Oeste speed stunt. Emsavion News Heli Complete the Lago Bonito helicopter stunt. Prisa Fresca Car Complete the Sachayuyu car stunt. Similarly, weapons also have certain types of requirements that must be met before they are unlocked. LRD-3 Sniper Finish mission Training: Intel Grab. PBX Auto-Slug 4 Secure Altos. CC10 Shotgun Secure Islas Machaqwayes. Finish mission Training: Bridge Defense. PBX Super-Sniper 4 Finish mission Training: Wrong Side of the Tracks. 21-J Smart Rifle Secure Paso Ventoso. PWC V4.2 Wind Gun Secure Qachas. DA 9.3 Lighting Gun Secure Phuyu-Kuni. RG-PBA 9 Railgun Secure Kunka. PBX Mine Launcher 2A7 Secure Las Tormentas. AT3-X RPG Finish mission Training: Top Brass. Mods, also called cheat engines or trainers, are made by other gamers. Therefore, they can contain malware or cause bugs in the game. WeMod is a trusted source for free Just Cause 4 trainers that offers easy integration with Steam. Cheat Happens and Mega Dev have even more mods, but you have to pay for some of them. Each trainer comes with its own instructions for implementing cheats. Just Cause 4 trainers only work with the PC version, but you don't need Steam to use them.